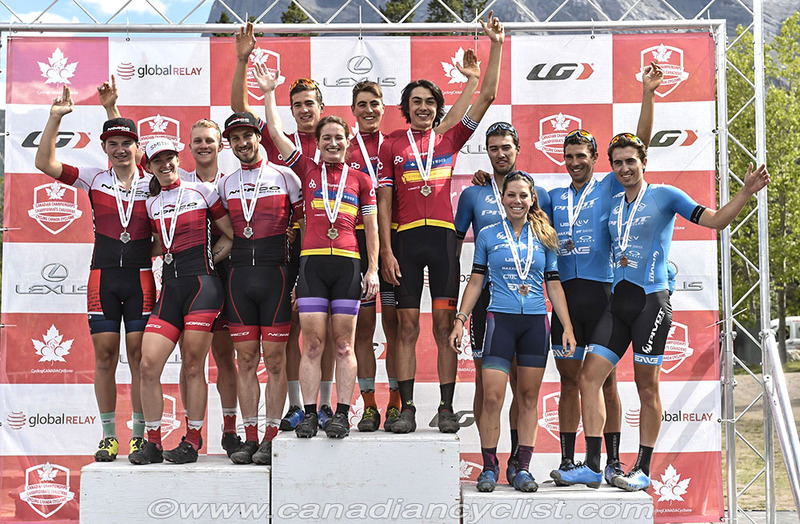 The 2018 Canadian XCO Championships concluded on Sunday with the Team Relay at the Nordic Centre in Canmore, Alberta. Cycling B.C. #1 took the title, a slim four seconds ahead of defending champions Norco Factory Racing. The Team Relay consists of teams of four riders from different categories each racing a lap of the cross-country circuit before handing off to the next rider on the team. Each team must include at least one woman and no more than one Elite man. The race quickly came down to three teams - B.C. #1, Norco and Pivot-OTE. Pivot-OTE (Raphael Auclair) took the lead on the first lap, followed by Norco (Quinton Disera) and B.C. #1 (Carter Woods), and continued to hold after two laps. However, B.C. #1's Holden Jones rocketed through the field on the third lap to put his team in the lead by a few seconds as he handed off to the final rider - national men's Under-23 champion Sean Fincham, who was up against Elite national champion Peter Disera of Norco. "It was pretty cool to be able to race against the big guys and I managed to stick on their wheels," said Woods. "You go as hard as you can, and leave it all out there." "Some of the other teams had put their guys out in earlier laps, and we had put Sandra [Walter] out for Lap 2, so I definitely had some spots to make up," said Jones. "So I just left everything out there and fought to get Sean into first place for the last lap." Fincham started the lap only five seconds ahead of Disera, and the pair battled all lap. Disera would close to within a few metres of Fincham only to have to back off, allowing the gap to open again. At the finish, the gap remained four seconds. Pivot-OTE completed the podium. "Usually teams put their woman third, but we changed it up and I went second," said Haley Smith for Norco, "and B.C. did the same with Sandra. I think it worked out and I was able to minimize the damage they did." "Sean got out just in front of me and I knew it was going to be a fight," said Peter Disera. "I think I got a little too excited; I reeled him in on one of the climbs, but the gap grew again as I caught my breath. I did that twice, but then I'd fade and fall back a bit."